A live online tutoring platform, Vedantu aims to personalise and democratise learning with primary focus on 6th to 10th tuition sector in CBSE & ICSE curriculum. Students also have an option to prepare for tougher competitive exams like NTSE, PSA etc. or simply get their doubts cleared anytime, anywhere. The company spot and create quality teachers and ensure the quality education spreads without boundaries. Vedantu has completely re-imagined 1-to-1 teaching learning and created in-house WAVE technology (Whiteboard, Audio and Video Environment). It makes online learning a pleasure and enables teaching sessions even at a low bandwidth. A first of its kind ‘Marketplace for Teachers’ model, which has already been proven in other countries, Vedantu is on a mission to make it a game changer in India too. Here a student/parent can come and browse through a list of teachers based on ratings/reviews, communicate with them (chat/talk), choose a teacher and learn Live online with him/her. No other platform in India gives this end-toend integrated experience. This model addresses the basic problem of generalization and one-size-fits-all in education today. Vedantu is the only initiative in the EdTech space that uses data analytics and algorithms to connect the most relevant teachers to the students as per their requirements and monitors the sessions. This is the most unbiased educational practice. We have so far catered to over 19K students and have successfully conducted over 10k hours of learning sessions. 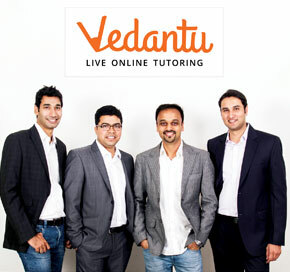 Vedantu offers services for students throughout India and in some special cases students abroad. The company is currently focusing on tier 1 cities like Bangalore, Mumbai and Delhi, but it is getting traction from over 92 cities already. Vedantu has recently raised $5million in a Series A round of funding from Accel Partners and Tiger Global Management. The first venture by these friends in education, Lakshya, was founded in 2006 which later got acquired by a listed company called MT Educare (Mahesh Tutorials) in 2012. As part of Lakshya the founders taught and mentored more than 10,000 students and trained more than 200 teachers. Generalisation – Vedantu is solving the basic issue of one size fits all mentality in education today. Apart from 1-to-1 learning, the company realized that best learning happens when a teacher sits with a student to discuss and teach him/her on a notebook shared between them. The shared Whiteboard on Vedantu replicates this for student and teacher sitting thousands of kilometers away. Vedantu is inducting and creating a pool of high quality teachers/mentors who really love what they do and who are ‘Teachers by Choice’. In the process, company is creating employment for Women/Housewives who previously had limitations in going out to teach. Last mile problem – Making quality learning accessible anytime-anywhere with absolutely no boundaries. The new app for teachers, ‘Tapp’ connects them to students in no time. The content library is available at a click of a button. One can sort content, check documents, view videos, and attempt tests and assignments – all at one place. The company has integrated ‘Click to Call’ model.